Some of the 80 panels included slide shows or offered simple readings that played to the theme while audiences sat raptly in their seats. Other presentations however, made the audience part of the performance, getting them up and out of their seats and moving. 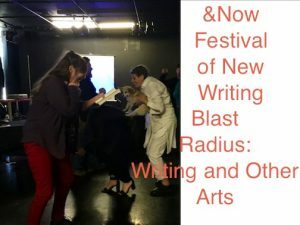 Of special note was the session called Between Language and Body, in which dancer Laura Ann Samuelson and author Bhanu Kapil explored sensations and gestures as they “incubated” their work simultaneously. In the Rules of the Cosmos, part of the Red Rover Series curated by Laura Goldstein and Jennifer Karmin, cosmological works were read and combined and exchanged with other performers who then formed star-like clusters that moved and chanted across the stage. It’s no surprise that Tantra was tapped to participate in the Festival this year and last. As an instructor of online Experimental Fiction at the Writers’ Program, Tantra is used to demonstrating the many directions creativity can take. In her online course, she teaches students to question conventional definitions of plot, structure, character, language, and placement of text on the page in order to infuse work with an authentic voice and an original vision. Tantra’s panel at the &Now Festival included members from Friends of JEF (Journal of Experimental Fiction). Publisher Eckhard Gerdes, Xena Stanislavovna Semjonov, and Carla M. Wilson sat behind a table and read, until Tantra coaxed them up out of their seats and away from the table to sit closer to the audience. She then explained to the attentive audience that exercise is a part of her creative process, and that writing from a kinetic mind-set, rather than a sedentary one, helps her to generate ideas and make the action bigger, the scenes more vivid, and the characters fully fleshed out. She said that when she exercises, she often listens to podcasts and moves in sync with the sounds and emotions and plot arcs and rhythms of the story. To illustrate her point, she acted out her own characters — leaping and directing with arms wide open — to demonstrate how she conceives of big scenes and generates vivacious plot points she could never have created while sitting at her computer. Finally, Tantra called on the audience to stand up, put aside their inhibitions, and allow themselves to join her in feeling and moving to her words. Once up on their feet, any initial reluctance there might have been on the part of the audience soon gave way to great enthusiasm and playfulness. Another artistic boundary had successfully been broken. Tantra’s next experimental fiction course will be offered in 2016. Study short fiction writing with her this summer by clicking here. To read more about the &Now Festival, go here.